Fish Camp Lodge is a quiet log cabin retreat overlooking a trout pond, accessed via Woodlandstar Circle, in the northeast portion of the Iron Horse community. Fish Camp serves as the trailhead for a myriad of outdoor recreational activities including hiking, mountain biking, snowshoeing, cross-country skiing and, of course, fishing for large rainbow trout in the pond. During winter holiday season the frozen trout pond becomes an ice-skating rink at the doorstep of the lodge, immediately adjacent to a cozy campfire warming area. Swimming, diving and boating are not permitted at Fish Camp. A member must accompany guests at all times. 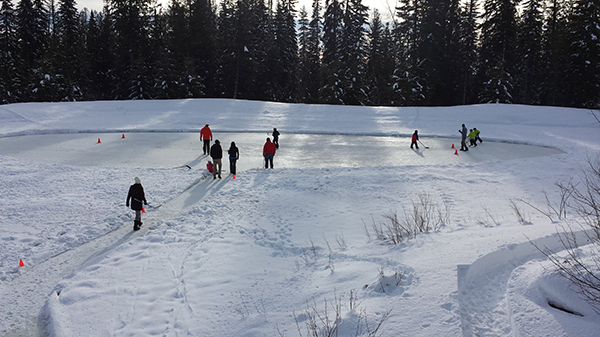 Reservations are required for group events at the lodge; to make a reservation, please call 406-863-3006. Fishing equipment is available at the lodge. Please contact Outdoor Pursuits at 406-863-3006 for availability. Due to safety considerations, ice fishing is only permitted at Fish Camp with prior approval from the Outdoor Pursuits staff.